Christopher Aston, assistant director of Student Development, receives the 2017 Presidential Award from Vice President of Student Affairs and D Dean of Students William Watkins. Photo by David J. Hawkins. 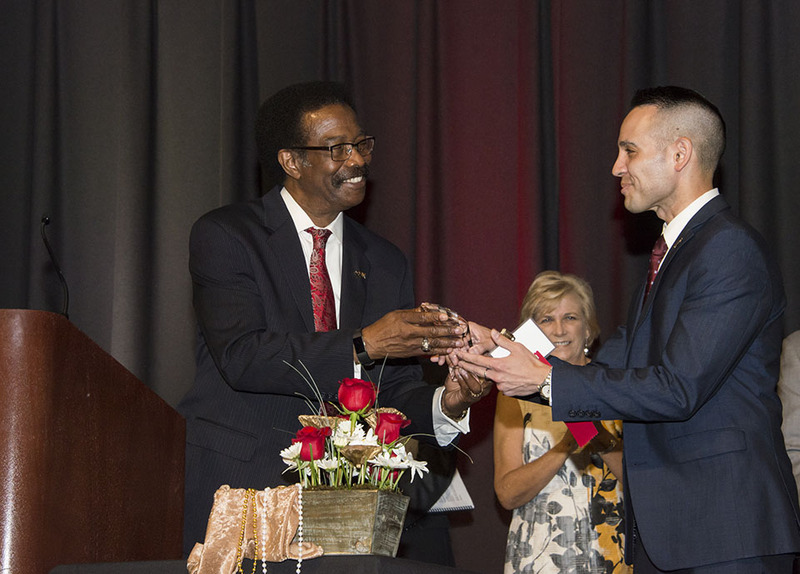 California State University, Northridge celebrated to its 51st annual Staff Service and Recognition of Excellence Awards ceremony on May 4 at the University Student Union’s Northridge Center. CSUN honored approximately 270 staff members who have served the university for five, 10, 15, 20, 25, 30, 35 and 40 years, and recognized several staff with special excellence awards. More than 400 people attended the event. Provost Yi Li introduced the four staff members marking their 40th year with the university: Robert Ryan (College of Engineering and Computer Science), Sharon Eichten (Budget Planning & Management), Melda Buslon (Klotz Student Health Center) and Chester Prezelomiec (Department of Art). Li shared some fun facts about the year (1977) when these employees joined CSUN, including that the average price of a gallon of gas was 65 cents. Samir Hamawe, peer counseling specialist in University Counseling Services, received the Excellence in Diversity and Inclusion Award. Hamawe coordinated campus awareness campaigns like the BLUES Project and Project DATE. “His values of diversity, inclusion and multiculturalism are infused in the peer education programs he develops. His leadership is purposeful in aligning discussions about education efforts and programming with the university’s core value of respecting all people,” said Susan Hua, director of Equity and Diversity, who presented him with the award. Six merit awards for exceptional performance went to Donald Foster, director of IT operations; William Krohmer, administrative operations analyst in the biology department; Carolina Franco Ordaghi, public relations and event specialist in the dean’s office of the College of Engineering and Computer Science; Julie Hunter, catalog editor of Undergraduate Studies; Bianca Plascencia, special education support coordinator; and Susan Krikorian, health educator at the Klotz Student Health Center. Rob Gunsalus, vice president for University Advancement and president of the CSUN Foundation, awarded Vahram Shemmassian, a faculty member in the Department of Modern and Classical Languages and Literatures, with the Alumni Relations Award for his outstanding work within the Armenian Studies Program and his efforts to raise awareness. “He helps identify new alumni volunteers and connects students with alumni networks thanks to his hard work and strong community relationships,” Gunsalus said. Heather Cairns, director of Administrative Services at University Licensing, received the CSUN Leadership Award and said she was honored to be selected. Hilary Baker, vice president of Information Technology and chief information officer, presented the Jolene Koester Team Award to the Bridge to the Future, Design and Implementation Team (B2F). Vying against eight other nominated teams, B2F was recognized as a significant initiative that will bring about positive change. B2F is a university-community collaboration between CSUN and the community of Canoga Park that will provide a tuition-free, four-year university education at CSUN to those students admitted into the program. B2F was one of four programs in the nation to be recognized by the Association of Public Land-grant University (APLU) with a grant award to support the initiative. You may view a complete listing of honorees and award recipients as well as photographs from the event here.